Hotel Shivalik is located in the serene surroundings of Kasauli Road, Dharampur (H.P.). It is the only place offering a panoramic view of green forests and scenic beauty of landscape.We are quite unabashed in our desire to ensure that your stay is comfortable and enjoyable. We have all the modern amenities for a comfortable trip. It's balconies, throughout the year, present views of shifting scenario of the mother-nature. The snow clad mountain peaksin the light setting seen and lower Shiwalik hills provide such a panoramic view which fascinates both the lovers of delight and solitude. Hotel Shivalik has hosted a number of dignitaries, distinguished guests and other celebrities with super Deluxe and Deluxe rooms all of them offering a view of great hills, modern amenities, and gastronomic delights; the hotel continues to remain a house of tradition and hospitality, where personal care is the hallmark of service. Hotel Shivalik has 35 luxuries rooms that pamper you with all the modern amenities that make you feel completely at home-even so far away from home. honeymoon suits, family suits, super deluxe rooms, deluxe rooms, connected with intercom, coloured TV with satellite channels provided in every room, open balcony, completely independent no disturbance, floors covered with carpet and tiles. Beautiful locations of sun rising and setting. Rooms running both hot and cold water. A 27 room hotel with a good dining hall which can also double-up as a conference hall. View of the valley, good parking facility and a huge terrace for parties, are other very usefull features of this hotel. Well appointed, centrally Heated Rooms , 24 Hours running Hot and Cold Water , Private sit - Out Balcony , Purified drinking Water , Attached Baths, Direct Dialling Valley facing Rooms, Floor covered with vitrified tiles and carpets. Attached bath with running hot & cold water round the clock. Coloured T.v. with satellite channels provided in every room. Deluxe Room: Rs.4300/- per couple per night. Super Deluxe Room: Rs.4800/- per couple per night. Includes: Accommodation, Breakfast and Taxes. Deluxe Room: Rs.5300/- per couple per night. Super Deluxe Room: Rs.5800/- per couple per night. Deluxe Room: Rs.6300/- per couple per night. Super Deluxe Room: Rs.6800/- per couple per night. Includes: Accommodation, Breakfast, Lunch, Dinner and Taxes. Deluxe Room: Rs.10600/- per couple. Super Deluxe Room: Rs.11600/- per couple. Deluxe Room: Rs.14700/- per couple. Super Deluxe Room: Rs.15660/- per couple. Includes: Accommodation for two persons, *Shatabdi Ac Chair Car Train Ticket Delhi - Kalka - Delhi, Pickup & Drop from Kalka, Breakfast, Dinner and Taxes. Deluxe Room: Rs.18210/- per couple. Super Deluxe Room: Rs.19150/- per couple. 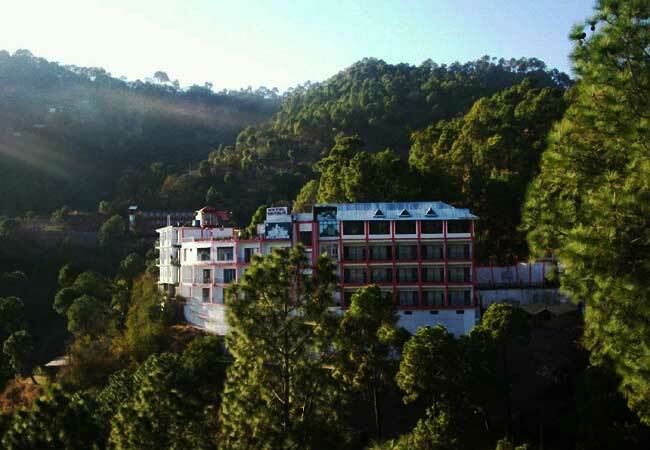 Includes: Accommodation for two persons, * Shatabdi Ac Chair Train Ticket Delhi - Kalka - Delhi, Pickup & Drop from Kalka, One Day Sightseeing Chail and Kasauli, Breakfast, Dinner and Taxes.